Fatahillah Museum Video Mapping for 2010 "Jakarta Creative City" by Sembilan Matahari, a creative lab from Indonesia. 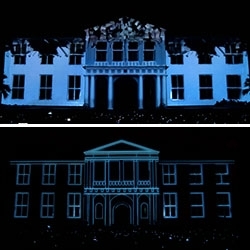 Fatahillah Museum Video Mapping has become the most popular collaboration project. The aim of the projection was not merely to produce a video but to prompt a new standpoint amongst public regarding public space. The 14 minute film recounted the history of Jakarta, from swamp sentiment to metropolis, as a digital clock counts down the city’s history: first, the sound of birds, creaking trees, animals in the long grass, as a luminous forest slowly takes form, branches lifting skyward. Archive images narrated the story of colonization and construction in the 1600s and the anguish and destruction of war in the 1940s. Scaffolds and bulldozers represent the development of the high-rise city, followed by street lamps, satellites and traffic lights, signifying the coming of the digital age. The pulsing energy of the metropolis combined graffiti and street culture with traditional patterns and music; a visual representation of the message that opens the film: “Transforming old town as a creative playground”. Read more at Sembilan Matahari.